Aug 2018 Facebook) Rented a medium sized slide/bounce house combo for our sons 2nd birthday and couldnt have been happier! It was much larger than we expected, which was a pleasant surprise!! They set it up in no time and arrived to take it down right on time! We were very pleased and will absolutely be using them again in the future!!!! May 2018 (Google ) The kids like it a lot and rental prices are reasonable! Scheduling flexibility and setup were a breeze! Everyone I had contact with was professional and so helpful! Thank you for making my party a success. The best experience ever! Really good prices and I would definitely do it again!Thanks for the smooth process and great products! (Facebook): We rented a bounce house, table and chairs and snow cone maker. The rentals made the party! Kids loved it. Dealing with Bounce Hoppers was super easy. They were reliable, in touch and friendly. Highly recommend. I will never use anyone else for our party entertainment. The inflatable was great, clean, and they were so easy to work with! Thank you so much. 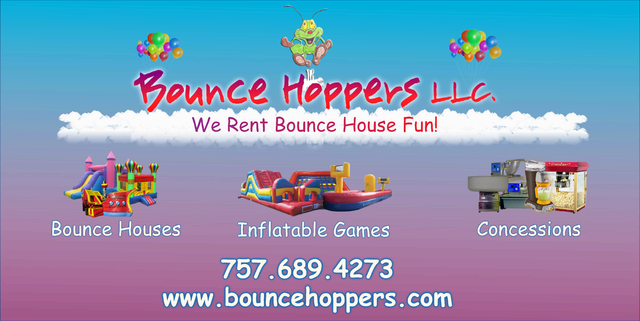 Bounce Hoppers was so prompt in delivery and pick-up and the unit was extraordinarily clean - they exceeded my expectations, and the princess castle bouncer was the hit of the party!